Added by thronn on April 15, 2017. 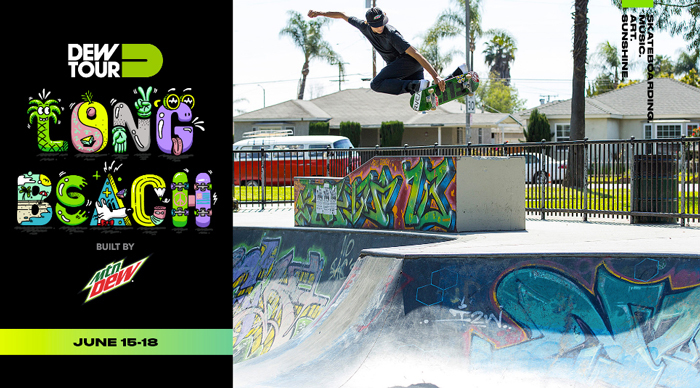 The Dew Tour is charging into Long Beach, California this summer with a stand-alone bowl competition in a bigger bowl and a new amateur division – all in addition to the existing Pro Street and Team Challenge events. This summer’s most anticipated skateboard competition and festival will showcase an international roster of top pros and amateurs when it returns to the at the Long Beach Convention and Entertainment Center from June 15-18, 2017. Almost doubling in size from 2016, this year’s expanded bowl setup will create an ideal environment for an exciting new Pro Bowl competition offering fans ample seating to watch their favorite skaters. Up to 24 invited pros, including Curren Caples will maneuver the massive new course featuring corners, transfers, hips, and plenty of flow. “I’m hyped on Dew Tour having a dedicated bowl event this year and a contest format that appeals to all different types of pros’ styles of skating,” said Caples. Final details for the newly designed street course will be announced soon, but it will have three progressive sections. The Tech Section will include flat bars, manual pads, and ledges, the Rail Section will focus on a challenging layout with an A-frame and 9-stair rail, and the Gap Section will push creative boundaries with an assortment of stair sets, a bump over bar, and Euro gap.